It’s here once again! 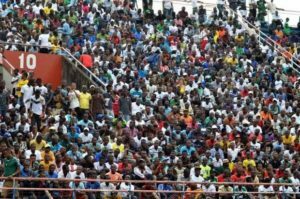 The Sierra Leone Premier League will return in a week time, thousands of fans are in anticipation to see their teams play. For over four years now, the country’s Premier League did not play due to the impasse in the country’s game as club owners were not ready to accept the Isha Johansen led executive. Sierra Leone is currently under suspension by FIFA thereby fading the initial hopes of the players to qualify for the 2019 Nations Cup. As the league is set to kick start on January 27th 2019, a huge turnout is expected from supporters across the country for its commencement. However, the question now is, how would these enthusiastic supporters continue in this regard? It is not a secret that fans abandon their local teams for European leagues matches leaving our Stadium very empty to a situation which most times affect the running cost of the Premier League Board as well as the clubs. Now the league is set to return, and supporters are in readiness to commit their support to their various clubs we are hoping to see full cooperation from all of them. “I support Mighty Blackpool, and I hope we win the League. I am ready to see my team play, and to support my team to the fullest, “Mohamed Kamara a die-hard Tis Tas Fan explained. Also, thousands of fan across the country have bought their supporter’s jersey as a way of contributing to the team they support. The Sierra Leone Government boosted the League for the first time with a whopping two Billion Leones to ensure the league starts without any hindrance. Sorie Ibrahim Sesay, Head of Competition at the Sierra Leone Football Academy has rubbished concerns that the Premier League will not be recognized by CAF because of the suspension, noting that it has no implication on the said League as it is the right of all members of Africa’s Football Governing Body to organize local leagues and competitions. The Chairman of the PL Board Emmanuel Saffa Abdulia has reaffirmed the commitment and support of the Government and hope that the league will be run in an inclusive manner, citing full cooperation from all and sundry. Thirteen (13) teams will take part in the competition after going through the due process. FC Johansen is the only Premier League team that has declined to participate.